Welcome to I/501st PIR. A website dedicated to the men that served in Item Company 501st PIR from it's creation to deactivation at the end of the Second World War. 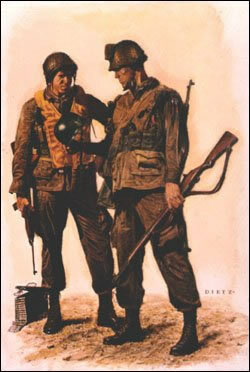 On the pages that follow you will find information about the training, battles, victories of Item Company from it's begining at Camp Toccoa Georgia in 1942 to deactivation at Ft. Benning Georgia in August 1945. We are an Arizona based group of reenactors and amateur historians that endevor to keep the memory of America's World War II Paratroop veteran's alive. Through Living history with public displays, events, and presentations, we attempt to educate the public in the historical significance of not only the 101st Airborne but all those who served duringe the Second World War. We are always looking for new recruits interested in history and keeping the memories and legacy of our veterans alive. Contact I/501st for information on joining Item Company.